Despite passion and good will, a missed opportunity. rütal Legend is probably one of the biggest bait-and-switches in recent gaming history. Yes, it's still very much the story of a concert roadie getting sucked into a heavy metal-themed fantasy world. But up until the last few weeks before its release, the developers were still only promoting the game as if it was strictly an open-world action-RPG in the vein of a Legend of Zelda game. 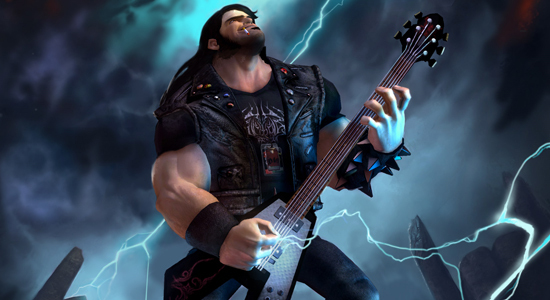 In truth, Brütal Legend's main focus ends up being "stage battles" which are essentially Command and Command-style, real-time strategy skirmishes. The advertising campaign, demo and even the back of the box barely reference this, the latter only vaguely stating that the player will "lead metal minions on a world tour of destruction." With a myriad of battlefield abilities and a bulging unit roster across three factions, Brütal Legend overcomplicates things.In a way, you can understand such a move, given the past struggles to translate the classic mouse and keyboard interface from PC down to console controller. Still, I can't help but feel many have and will continue to be misled about this aspect of the game. To be fair on Brütal Legend, it at least tries a new approach, with all the action being controlled from a third-person perspective of the main character Eddie Riggs. This results in a more fluid equivalent to a standard cursor, though combined with the odd lack of a map it's pretty difficult to keep track of everything going on. As satisfying as it is to lead the charge with a group of forces at ground level, without a map you have to constantly return to the air and observe the battlefield or you risk being flanked by enemy forces. And with a myriad of battlefield abilities at your character's disposal and a bulging unit roster across three factions, Brütal Legend overcomplicates things too much to provide a game pad-friendly RTS experience. The multiplayer focuses entirely on online stage battles, and as you'd expect, the same problems endemic to the single-player are present here. In a way the main game serves as a tutorial for it, but as it is now I can't see there being a big and long-lasting player base for it online, especially given the multiplayer heavyweights due for release this holiday season such as Call of Duty: Modern Warfare 2. Despite creating skewed expectations and failing to provide consistently compelling gameplay, it's obvious a lot of love and attention has gone into Brütal Legend. Much like Double Fine's previous game Psychonauts, the story and characters are one of the highlights here. Excellent voice-acting lends credence to the Pixar-esque animation with rock luminaries like Jack Black and Ozzy Osbourne delivering possibly the most involved celebrity performances in a game to date. Even non-celebrity are filled with voice-over veterans such as Jennifer Hale, who gamers will recognise as the voices of Bastila Shan in the Knights of the Old Republic and Naomi Hunter in the Metal Gear Solid series; amongst others. Despite failing to provide consistently compelling gameplay, a lot of love and attention has gone into this.The audio also pleases in the music department, with a broad mix of metal consisting mainly of classics by the likes of Judas Priest and Motley Crüe, with a smattering of modern bands such as Dragonforce and Mastodon. Despite the focus on the real-time strategy aspect, some basic action-RPG elements make up the rest of the game. Protagonist Eddie Riggs has some basic melee and ranged attacks in the forms of a sacred axe and his trusty guitar. You can also upgrade him and his car over time, but I didn't feel that this really made all that much difference, especially in second half of the campaign where the game primarily consists of escorting your tour bus between one stage battle to the next. Many of your abilities and battle commands are executed by performing short riffs on your guitar, another feature reminiscent of the instruments in past Zelda games, hitting a few buttons in time with the on-screen display similar to something like Guitar Hero. The world of Brütal Legend is probably the game's other main draw, with landscapes adorned with huge stone guitars, metal pipe sculptures and even a Mount Rushmore of rock gods creating a visually arresting land. As unique as it looks, there sadly aren't many compelling things to do in it outside of the relatively short campaign. Most of the side-quests that can be undertaken are pretty monotonous, small-scale battles, though for the obsessive collector there are scores of relics scattered around that unlock more songs and increase your total health when found. Despite all the passion and good will that went into Brütal Legend, it still comes off as a missed opportunity. Regardless of the expressive characters, great script and incredible world design, its ultimately let down by disappointing gameplay. Perhaps if it had focused more on expanding the action-RPG and open-world elements, or even just streamlining the cluttered RTS system, it could have been more.